If you've ever taken a road trip across America, you might be familiar with the hokey tourist attraction known as the mystery spot. Painted roadside signs often with prominently-displayed question marks advertise a local oddity you can pay a small admission price to explore—and maybe check out their gift shop, hay wagon ride, or zip line too. Tourist traps that they may be, mystery spots date back to the Great Depression, extant pieces of Americana from a bygone era reliant on old-fashioned optical illusion to amaze and intrigue. The draw is the mystery, and the mystery is usually gravity, or the lack of it. Proprietors claim their mystery spots sit atop areas where the normal laws of physics don’t apply, and they invite you to experience the phenomena (usually created by rooms built on a slant) by walking up walls or witnessing water flow uphill. 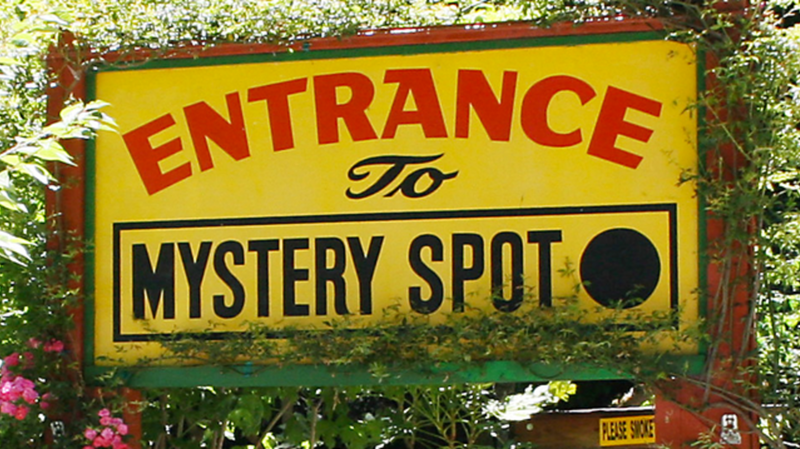 Explore the science, myth, and kitsch of the mystery spot in these 10 sites around the world. One of the most famous mystery spots in the United States—and one of the best at selling their brand—this mystery spot found in the redwood forests outside Santa Cruz boasts a gravitational anomaly that, in reality, is a trick of perception. Mystery houses are essentially rooms or houses built on slants of at least 20 degrees, engineered so that a person standing in the space orients themselves to the slanted room—and not to ground. Visual cues counter to reality often help convince and disorient, so trees and windows are placed on a slant, and the supposed phenomena is demonstrated by balls rolling up the floor and chairs staying put halfway up a wall. Mystery spots typically come with their own origin stories, and there seems to be a formula to the history, exemplified by the story told by the owners of the mystery spot at St. Ignace: “In the early 1950s, three surveyors named Clarence, Fred and McCray came from California to explore the Upper Peninsula. They stumbled across an area of land where their surveying equipment didn’t seem to work properly. For instance, no matter how many times they tried to level their tripod, through the use of a plum-bob or level, the plum-bob would always be drawn far to the east, even as the level was reading level.” Look out for tall tales of prospectors, lightheadedness, and instrument failure. The Campbell Brothers of Confusion Hill add a dash of the mythical to their mystery spot’s lore with claims that the elusive (and extremely fictional) Chipalope (half chipmunk, half antelope) originated at Confusion Hill. According to the Campbells, there was a magical accident that combined two happy male and female antelope and chipmunk couples. Chester the First, as the male was called, gains self-awareness and, realizing how rare he is, decides to hide away from humans’ view—except perhaps on dewy morns at Confusion Hill. Whoever wrote the description clearly had a great time doing it, almost daring city folk to come by and just have a good time: “This MYSTERY HOLE thing seems to affect different people in different ways depending on whether they cling to the new style education or stray to the plain old C.H.S. (common horse sense) method. We have noticed that the highly educated folks do ask more questions than the lesser educated ones do. Whatever these unidentified effects may be, they are believed not to be a serious threat to those searching for fun and excitement.” Good thing, too. The Oregon Vortex—home to the House of Mystery that was once a mining company assay office and a curios shop—amps up the pseudo science behind its spot with an explanation that connects the Oregon Vortex to all vortices in the universe and alleges that its force is strongest when the moon is full. Gold Hill also makes the audacious accusation that the Santa Cruz Mystery Spot is a copy of the one at the Oregon Vortex. Spook Hill of Lake Wales, Florida, claims, according to local legend, that its gravity hill (an exterior optical illusion created by the land surrounding a road) was created by the ghost of either a huge gator or a Native American chief who fought each other in an epic battle that formed the lake at that spot. The magnetic hill at Ariccia outside of Rome offers the same phenomena. Hills like these don’t necessarily come with an outlandish story, since the forces that trick the eye and defy our sense of equilibrium aren’t as visibly manufactured as the sideways-leaning mystery spots. It’s confirmed, however, by the CICAP Lazio (the "Italian Committee for the Investigation of Claims of the Paranormal" section of Rome), which conducted a scientific analysis of the spot in 2009, that the slight decline is actually a slight incline. The large red magnet sculpture on the side of a public dirt road in rural southern Australia indicates the location of this magnetic hill—one that legend says can trace its discovery all the way back to the 1930s when the site was known as Bruff’s Hill. Former farmer Murray Catford says an acquaintance driving his new motorcar in the area got a flat, put a stone in front of a wheel to prevent the car from rolling, and watched it roll uphill.